Pet Kittens are sold already spayed/neutered (billed at cost to the new owner). Kittens are usually ready to go to new home at between 12-16 weeks of age. We encourage the motherly bond until we feel each kitten establishes his own independence. We do not sell breeding Maus except by references from someone we know. We are NOT interested in participating in hybrid programs. All potential kitten owners are required to sign a detailed contract which states in part that the kitten is not to be declawed or allowed outdoors. Pre-Purchase questionnaire - In order to ensure the best match possible. Our goal is to match the kitten to the right owner. 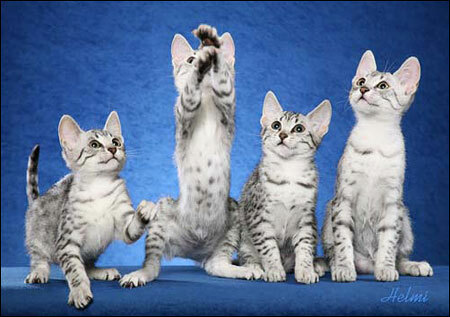 If you are interested in reserving a Maullenium kitten from our next litter, we are accepting reservations. Non-refundable deposit for Reservation List - A non-refundable holding fee/deposit to reserve a kitten. We will refund if we do not supply the kitten within the agreed upon time.